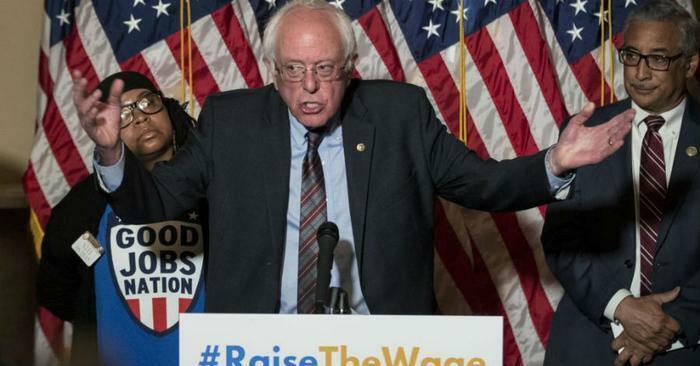 Sen. Bernie Sanders (I-Vt.) has introduced legislation to prevent the nation's largest retailer from buying its own stock until it raises workers' wages. The bill, called the Stop Walmart Act, actually targets all large publicly traded corporations. It would prevent companies from buying their shares on Wall Street unless they pay all employees at least $15 an hour. Sanders and bill co-sponsor Rep. Ro Khanna (D-Calif.) say Walmart plans to use its profits to purchase $20 billion of its own stock over the next two years when it could be using the money to raise the standard of living for its employees. Stock buybacks are common among large companies since it generally boosts the companies' stock price. It benefits shareholders, as well as the company, which sees the value of its stock holdings go higher. Stock buybacks usually increase the value of a company's stock while raising workers' wages often reduces profit margins, which sends stock prices lower. In recent years, most publicly traded companies, including Apple, have embraced stock buybacks as the preferred method of returning cash to shareholders. Another method is the payment of dividends. Sanders made his proposal unusually personal, pointing out the family of Walmart founder Sam Walton owns 50 percent of Walmart stock with a reputed net worth of around $180 billion. Sanders claims 55 percent of Walmart employees are food insecure. “While tens of thousands of Walmart workers are struggling to survive, Alice Walton had no problem amassing a private art collection worth half a billion dollars," Sanders said. "Enough is enough. The time is long overdue for the Walton family to pay its workers a living wage. If large, profitable corporations like Amazon and Disney can pay all of their workers a minimum wage of at least $15 an hour, so can Walmart." The measure, which has little chance of passage in a Republican-controlled Senate and being signed by a Republican president, also would require Walmart and other large publicly traded companies to allow employees to earn up to seven days of paid sick leave to be used to care for themselves or a family member. It would also place controls on executive pay, limiting the CEO's salary to 150 times the median pay of the company's employees. At the beginning of this year, Walmart raised its minimum wage to $11 an hour. Since then, however, Amazon has boosted worker pay to at least $15 an hour.